In his deep southern drawl, Miller struck out at the Supreme Court’s decision to remove Ten Commandments monuments from federal property. Ummmmm….no. Not strange at all to me. It is a fact that smoking at gas stations could ignite the gasoline and kill the smoker as well as other people in the vicinity. Not having one group’s religion paraded in a public place – that’s somebody’s opinion that it’s harmful, in a spiritual way. Another way to look at it – the “no smoking” sign protects us here on earth, in the good ol’ U.S.A. The Commandments – they protect people in the afterlife, if you even believe in an afterlife. The U.S. government doesn’t have any jurisdiction in heaven or hell or in people’s spiritual lives, in general. That’s what we call “separation of church and state”. It’s amusing to me that in much of the religious right rhetoric, they portray themselves as victims. This in a country that is dominated by right-wing Republicans. I hate waking up to the sound of a team of leaf blowers. I don’t know why homeowners’ associations seem to love blowing (pun intended) money on this frivolous expense. I don’t really notice any significant difference in the way the grounds look and I’m sure whatever the effect is, it’s very short-lived anyway. Rather than blow a bunch of foliage around, I’d rather that they do something with the strip of land in front of our place besides growing peet moss in the dirt. Put some sod down, get a little bit of landscaping. Remove the 3 foot wide cob webs above everyone’s front door. At least that has a chance of permanently making the place nicer and maybe even increasing its sale value too. But then we’re not in the HOA because we’re renters. For the past couple of weeks, we’ve been experiencing various hiccups in our DirecTiVo’s video playback and then in the past couple of days, it’s rebooted itself a few times. So basically I think the hard drive is about to die. 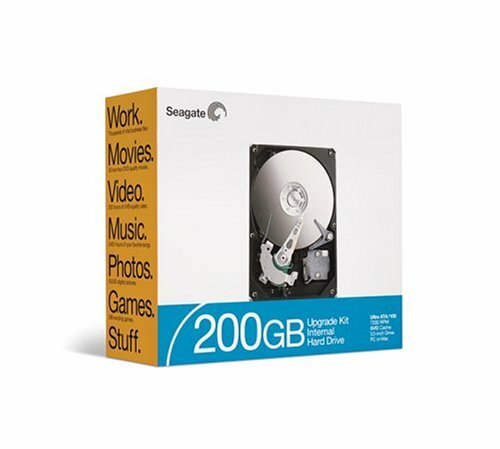 Last night I went to Fry’s and bought a 200 GB Seagate hard drive for $100 – $50 mail-in rebate. I set up my clunky Linux box and a CRT in the living room so I could work while we watched the other TiVo. The power supply in the Linux box is ridiculously loud (couldn’t hear the TV!) so I ripped it out and plugged in a spare Enermax power supply which was much quieter. Then I put the old TiVo hard drive and the new Seagate drive in the Linux box (had to remove the factory-installed “cable select” jumper from the Seagate) and booted into Debian and used dd_rescue to copy the drive. This morning I checked the status and the copy completed but with a few hundred KB of errors. I took the Seagate out, jumpered it for master, installed it in the DirecTiVo, booted up, and crossed my fingers. The TiVo started to boot but then rebooted itself and then it booted into the GSOD (Green Screen of Death – a “serious error” screen) where it said that I should leave it plugged in for 3 hours and let it repair itself. So I just went to work and let it do its thing. The hard drive was busy chugging away so maybe it will sort itself out although I am not terribly optimistic. Now I’m wondering if it failed because of the errors it encountered while copying the drive? Or was it because I copied a 160 GB drive to a 200 GB drive? Should I have used an identical drive? The thing was that the 200 GB drive was considerably cheaper than the 160 GB drives because of the sale and the rebate. The Yahoo! Photos team is proud to announce the release of its Easy Upload Tool for Firefox. This makes Yahoo! Photos the first online photo sharing service to offer a cross-platform bulk upload tool for the Firefox browser. Now instead of having to upload photos one-by-one, Firefox users can upload up to 300 photos at a time by simply dragging and dropping into their browser. Installing the Easy Upload Tool for Firefox is a snap – it’s only 40Kb in size, compared to 1.2Mb for the ActiveX version. I messed around a bit with Yahoo! Music Engine tonight, which I haven’t had nearly enough time to play with. I downloaded a bunch of plugins including Yahoo! Photos slideshow, Yahoo! Search, and Surfer. Interesting stuff. The one that inspired this post was Ian Rogers‘ MusicBlogs plugin which lets you pick a playlist and publish it to a public RSS feed on his musicblogs site. The RSS feed contains links to XSPF files, also published on his site. Since XSPF is a sharable playlist format, you can load one (like the one below) into Yahoo! Music Engine and if you are a subscriber to Yahoo! Music Unlimited, you can hear the entire playlist (if you are not a subscriber, you can listen to only 30 second snippets). Take RSS to the next level. Enhance the Publisher experience. Develop, experiment & learn how to monetize XML syndication.